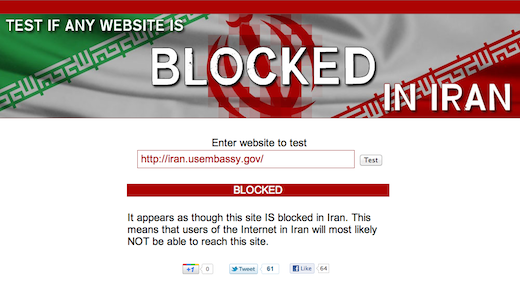 Virtual US Embassy blocked in Iran. We saw this one coming. As you might already know, The Next Web has inexplicably been blocked in Iran, and as would be expected, the Virtual US Embassy has joined the ranks of sites deemed threatening to the country’s stability. Launched just yesterday, Iran didn’t wait longer than a day before shutting down the Virtual US Embassy which, available both in English and Farsi, aimed to cater to Iranian citizens. It’s been over 30 years since there has been an official American embassy presence in Iran, and it’s not surprising that even a virtual presence is not welcome. While it lasted, Iranian citizens could have used the virtual embassy as an information portal on various issues, including how to obtain visas. The virtual embassy however, goes much further than that. Because the United States and Iran do not have diplomatic relations, we have been deprived of opportunities for dialogue with the citizens of Iran. But, using new technologies like this website and our linked social networking sites, we hope to bridge that gap and promote greater understanding. This Virtual Embassy is just the first of many ways in which we will seek to challenge the Iranian regime’s efforts to place an electronic curtain of surveillance, satellite jamming and online filtering around its people, and I look forward to enhancing our communication efforts directly to the Iranian people. Because the United States and Iran do not have diplomatic relations, we have missed some important opportunities for dialogue with you, the citizens of Iran. But today we can use new technologies to bridge that gap and promote greater understanding between our two countries, and the peoples of each country. Ironically however, there is little the virtual embassy can do since it can no longer be accessed by Iranian citizens.